The modern nation of Singapore was established by Sir Thomas Stamford Raffles in 1819. The British statesman saw the tiny island off the coast of the Malay Peninsula as an ideal spot to establish a British colony and trading post. As an agent of the British East India Company, Raffles was able to obtain permission from Malay officials to establish a trading post on the island. He named it Singapore, after its ancient name, and promptly opened the port for free trade and free immigration. When Singapore was first established, there were a mere 1,000 inhabitants scattered across the island. The population grew rapidly, however, as ships passed through the island’s international ports. Singapore became very ethnically diverse, and while Chinese made up the majority of the population, the island was peppered with immigrants arriving from Britain, India and the Dutch East Indies. In the early 19th century, Britain was a great producer of woollen goods, cotton cloth and glassware. The home market was limited, however, and all of the goods could not be sold. China and Southeast Asia presented a ready market, and Singapore was the perfect trading post. Multitudes of British merchants migrated to Singapore as soon as it was established as a British outpost. They ran a brisk business selling British goods throughout the Orient and buying spices and other Asian products that could be sold in Britain. In the 50 years after Raffles established his free-trade port in Singapore, the country prospered and the population boomed. The Dutch officially acknowledged British sovereignty over Singapore in 1824, and the island (along with two other trading ports and a number of small dependencies) were ruled as the Straits Settlements. When the British government needed a location to station their troops, the Straits Settlements were adopted as a crown colony, and were ruled directly from London. Singapore continued to grow as a busy seaport, now home to roughly 86,000 inhabitants. When the Suez Canal opened in 1869, British influence increased even more, and thousands of workers were brought in from India, China and the Dutch East Indies to work in the tin mines and on rubber plantations. As Singapore steamed into the 20th century it continued to prosper under British rule; however, Japan soon posed a threat. The British built a large and costly naval base to protect the island, but this “Gibraltar of the East” was only a more attractive target for the Japanese forces. Japan attacked and Singapore’s severely outnumbered forces were quickly defeated and forced to surrender. After three and a half years of Japanese occupation, they were finally ousted and the British forces were able to return. The Singaporeans gave the returning troops a hero’s welcome. Though many British and Empire soldiers had died due to Japanese brutality, the island of Singapore was returned to peace and stability once more. Though a few Britons remained in Singapore permanently, most returned home after a time. Out Of The Haze, A Singapore Spring? Sir Montague Maurice Burton was born on August 13th, 1885, in the tiny town of Kukel in Russian Lithuania. From his humble beginnings, he would go on to found the enormously successful Burton Company, responsible for outfitting so many British men throughout the 1900s. Burton was notoriously cagey about his early life. We do know, however, that he was born Meshe David Osinsky to Hyman Jehuda and Rachel Elky Osinsky. His father was a bookseller; however, he passed away shortly after Meshe’s birth. Following his mother’s remarriage, Meshe was sent to live with his uncle, Soliman Osinsky. Throughout his childhood, Meshe received a strong religious education and was well instructed in the Talmud. His uncle was a leader in the community and Meshe was well cared for; however, at 15, Meshe struck out on his own with the goal of starting a business in England. He arrived in England in 1900 with little more than £100 in his pocket, but his keen business intellect more than made up for the money he lacked. He began his business career as a peddler selling accessories from door to door. After just a few years, however, he managed to set up as a general outfitter selling ready-made suits for the working man. He purchased the ready-made suits from the Zimmerman Bros wholesale clothiers in Leeds and marked the price up by 30% in his retail business. By 1906, Burton was ready to expand, establishing a branch in Mansfield and then another in Sheffield. By this point, his stores offered both ready-made and bespoke (custom-tailored) suits. In 1909, Burton met and married Sophie Marks. Shortly after his marriage, he changed the name of his stores from M. Burton to Burton & Burton. Children soon arrived in the Burton home. A girl was born in 1910, followed by a boy in 1914, followed by twin boys in 1917. It’s unclear when Burton began going by Montague Burton – and up until this point, he had not changed it legally; however, in the birth records of his twin boys he gave his name as Montague Maurice Burton. By 1914, Burton had increased his number of stores to 14. The stores were scattered mainly throughout the industrial Midlands, and catered largely to the middle class. They offered a large variety of men’s wear, and soon grew to become the world’s largest wholesale made-to-measure tailoring service. As the First World War broke out, business boomed for Burton. He won a lucrative uniform contract, leading him to rapidly expand his workforce and the number of shops. Sales nearly tripled between 1915 and 1917. Though he was a driven businessman, Burton was an outstanding employer for his time. He was committed to providing healthy working conditions for his employees, providing meals and low-cost dentistry. He even contracted the services of an eye specialist for his tailors, recognizing the strain caused by focused needle-work. His efforts and business acumen were publicly recognized when, in 1931, he was knighted “for services to industrial relations.” He was a Justice of the Peace from 1930 onward, and was a prominent supporter of the League of Nations. Burton passed away on September 21st, 1952, at a dinner party for his executives and managers at the Great Northern Hotel in Leeds. His funeral was held at the Chapeltown Synagogue. In 1865, Alfred and Philip Holt founded the Blue Funnel Line and established the first direct steamship service between Europe and China. Prior to 1861, the London census showed a mere 78 Chinese-born residents in the entire city. This new steamship line would change all that. The Blue Funnel Line quickly built up its reputation thanks to its high quality service, management and crews. Much of the staff was hired from England, Scotland and Wales; however, a large percentage of the crew was made up of Chinese sailors. By using Chinese crews, the Blue Funnel Line was able to cheaply staff their liners, as the Chinese workers were paid a mere fraction of the salary earned by the European seamen. The first major influx of Chinese immigrants arrived in 1866. Quite a number of Chinese sailors arrived in Liverpool and decided to stay on rather than return with the ships. The sailors settled in near the docks in Cleveland Square, and the beginning of Europe’s oldest “Chinatown” was born. The Holt Shipping Company established a series of boarding houses in the area to accommodate their workers, as many Chinese immigrants signed on for temporary service with the ultimate goal of settling in England. Numbers rose steadily, and by 1871 – a mere six years later – there were over 200 Chinese living in Liverpool. A strong Chinese community naturally grew up in the area, as Chinese immigrants settled in and opened their own businesses. The resident Chinese ran a bustling trade, catering to their own countrymen who arrived unaccustomed to the English language and traditions. Chinese-run boarding houses, restaurants, laundries, and stores opened practically overnight, offering familiar comforts to new immigrants and visiting seamen. Many of the Chinese men who settled in Liverpool ended up marrying local women. In fact, the Chinese seamen were often seen as better prospects for marriage (than their British counterparts) as they didn’t drink and were typically hard workers and good providers. The late 19th and early 20th centuries saw a further expansion of Chinese influence both in Liverpool and throughout England. The Chinese settlement in Liverpool gradually spread further inland, stretching along side streets such as Kent Street, Greetham Street and Cornwallis Street. Dozens of Chinese restaurants were established, as were quite a number of gambling houses which catered to visiting Chinese seamen. London was seeing a similarly expanding Chinese population, with two distinct communities established in the East End. The 1891 census recorded 582 Chinese-born residents in London, and a full 80% were men (mostly settled sailors). By 1911, approximately 1,319 Chinese-born residents were living in England, and another 4,595 were serving in the British Merchant Navy. The extension of the Alien Registration Act in 1919 brought a decline in the Chinese population; however, this provided the resident Chinese to further establish themselves and improve working conditions. Hundreds of Chinese laundries were established across the country, along with dozens of restaurants and even the first Chinese school. World War II provided work for thousands of Chinese seamen, who were recruited to serve aboard British ships. At the end of the war, however, the Blue Funnel Line fired all of its Chinese employees – as did most other shipping lines – and thousands of Chinese seamen were forcibly repatriated. 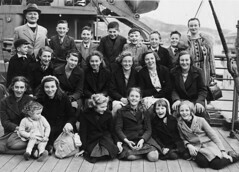 Many left behind wives and children, as they were never able to return to England.